One of the most incredible events to take place in the Church was the conversion of the Apostle Paul, the former Christian persecutor who became Christ s chief Apostle. 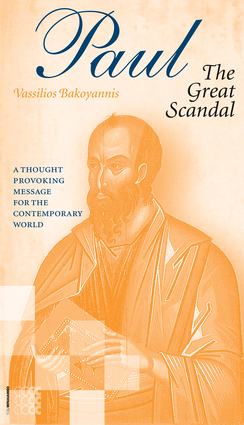 Paul: The Great Scandal looks at the life and teachings of the holy Apostle, the lamb that tamed the lion, and presents colorful events and details about his life that captivate the reader into full admiration for his great power and tremendous victories, all in the name of Christ. The author highlights some unknown and important facts about this phenomenal man that bring both enjoyable reading and a significant message to the contemporary world. Archimandrite Vassilios Bakoyannis was born in Greece in 1953 and was ordained in 1980. He serves in the metropolis of Patras, Greece. He received a bachelor's degree in theology from the University of Belgrade, Serbia, a master in theology from St. Vladimir Seminary, New York, and a PhD in theology from Atlantic International University, USA. Since 1975, he has authored over 50 spiritual books, several of which have been translated from Greek to English, Romanian, Russian, Arabic, Italian, German and Indonesian.